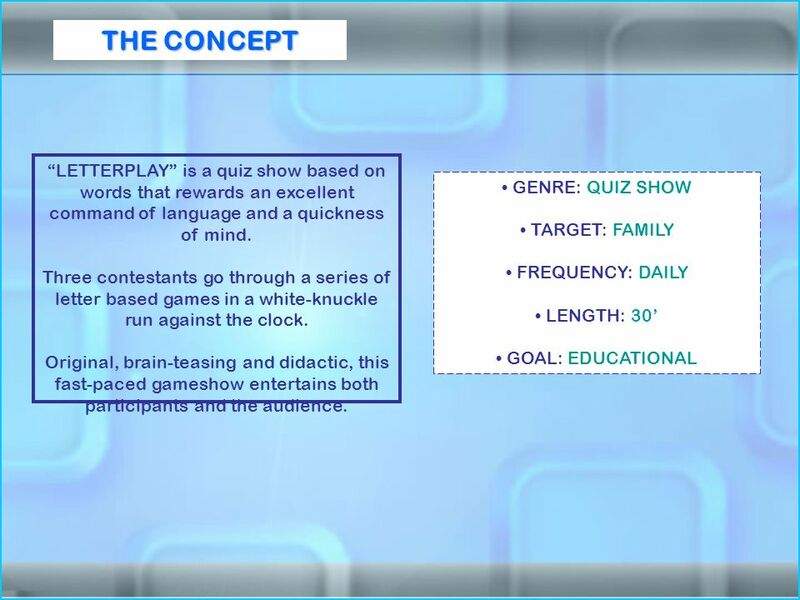 THE CONCEPT GENRE: QUIZ SHOW TARGET: FAMILY FREQUENCY: DAILY LENGTH: 30 GOAL: EDUCATIONAL LETTERPLAY is a quiz show based on words that rewards an excellent. 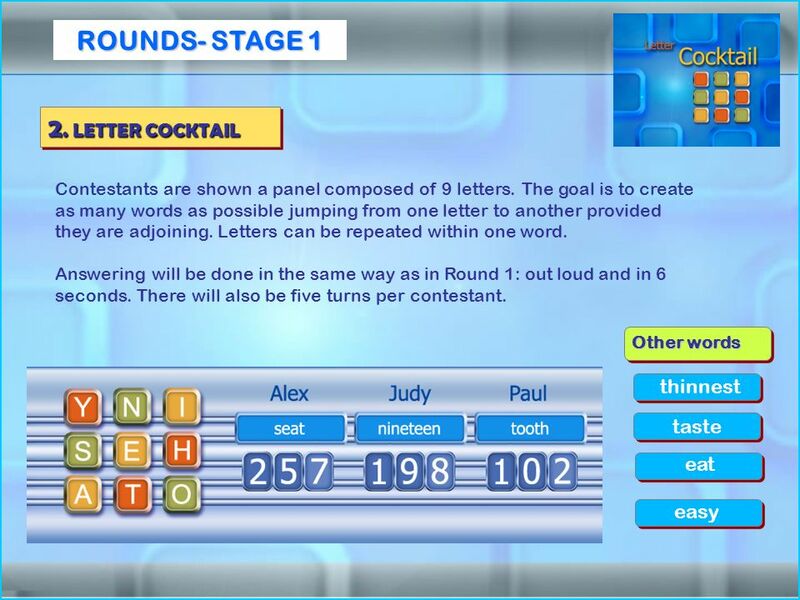 2 THE CONCEPT GENRE: QUIZ SHOW TARGET: FAMILY FREQUENCY: DAILY LENGTH: 30 GOAL: EDUCATIONAL LETTERPLAY is a quiz show based on words that rewards an excellent command of language and a quickness of mind. 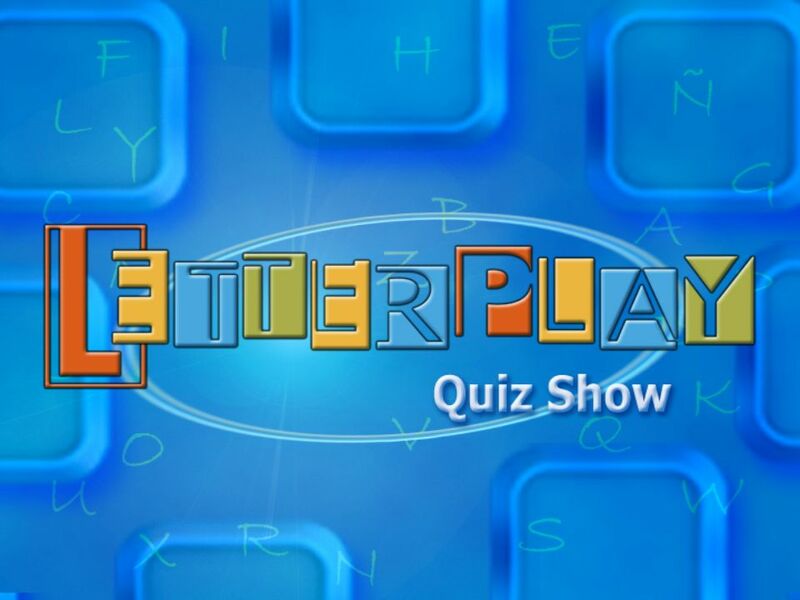 Three contestants go through a series of letter based games in a white-knuckle run against the clock. Original, brain-teasing and didactic, this fast-paced gameshow entertains both participants and the audience. 3 STRUCTURE 2. LETTER COCKTAIL 1. LETTER MIX 3. LETTERS IN BLOCK 4. LETTER BOARD 5. FIRST LETTERS STAGE 1 STAGE 2 STAGE 3 6. FLEETING LETTERS THE FINALIST GOES THROUGH TO THE LAST ROUND, ECLIPSE OF LETTERS, TO TRY AND WIN THE SHOWS JACKPOT. 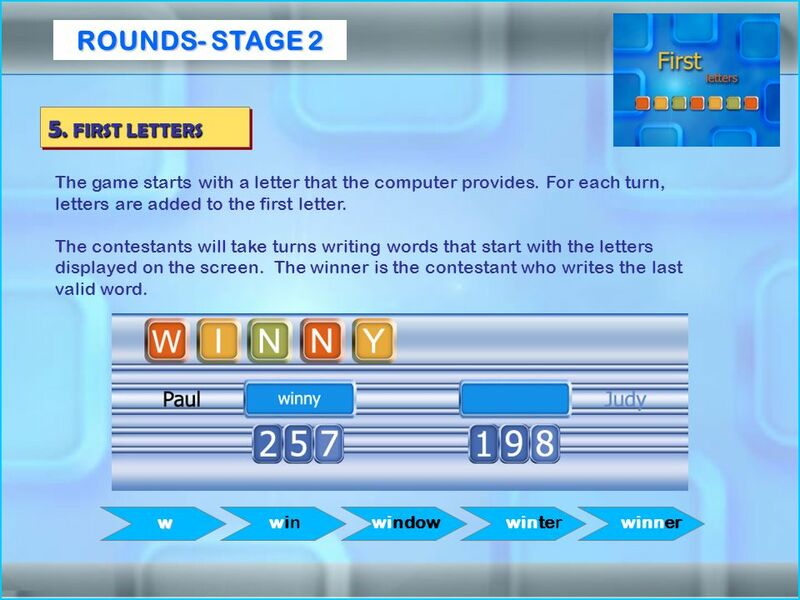 LETTERPLAY CONSISTS OF 6 ROUNDS. 3 CONTESTANTS PARICIPATE IN THE FIRST THREE ROUNDS. 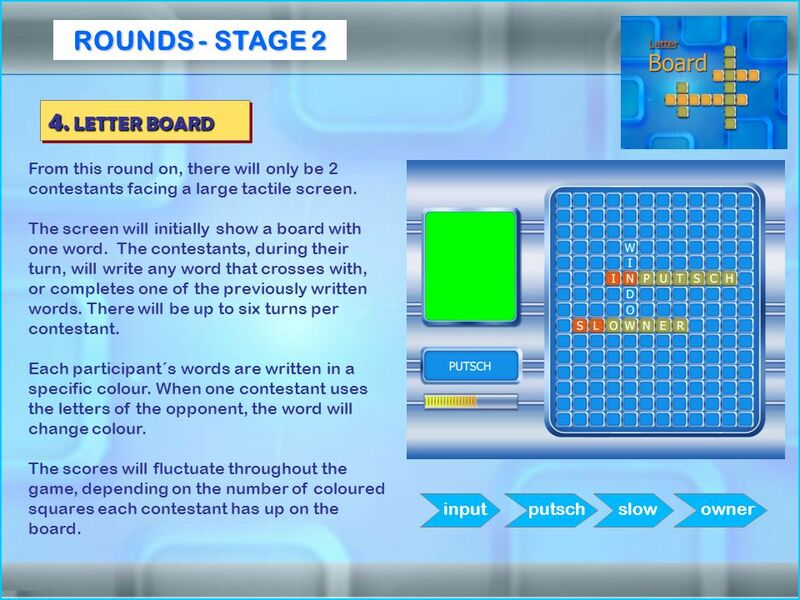 ONLY THE 2 CONTESTANTS WITH THE HIGHEST SCORE COMPETE IN THE FOURTH AND FIFTH ROUND. THE LAST ROUND IS RESERVED FOR THE FINALIST. 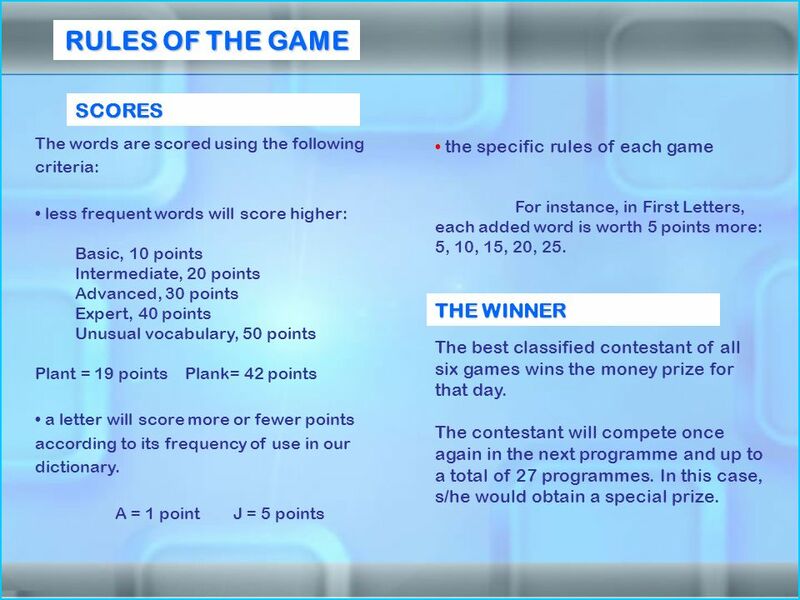 10 RULES OF THE GAME SCORES The words are scored using the following criteria: less frequent words will score higher: Basic, 10 points Intermediate, 20 points Advanced, 30 points Expert, 40 points Unusual vocabulary, 50 points Plant = 19 points Plank= 42 points a letter will score more or fewer points according to its frequency of use in our dictionary. A = 1 point J = 5 points THE WINNER The best classified contestant of all six games wins the money prize for that day. The contestant will compete once again in the next programme and up to a total of 27 programmes. In this case, s/he would obtain a special prize. 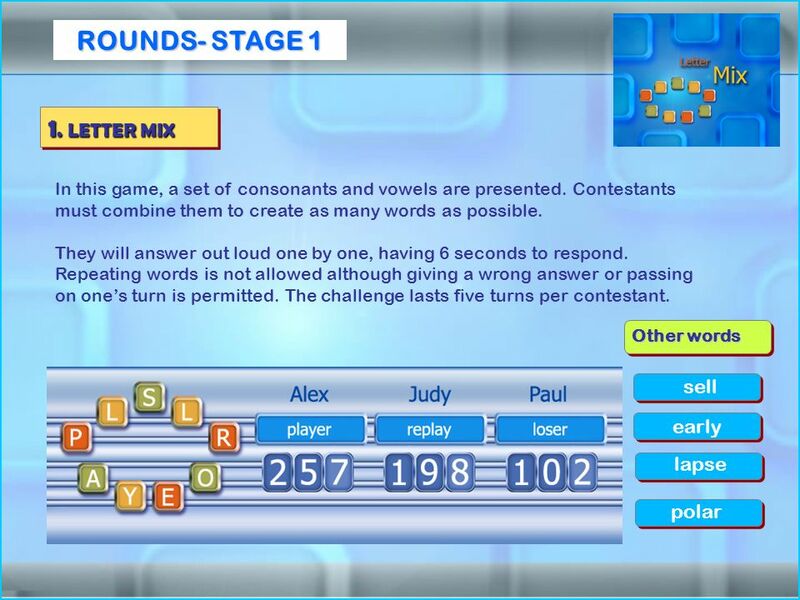 the specific rules of each game For instance, in First Letters, each added word is worth 5 points more: 5, 10, 15, 20, 25. 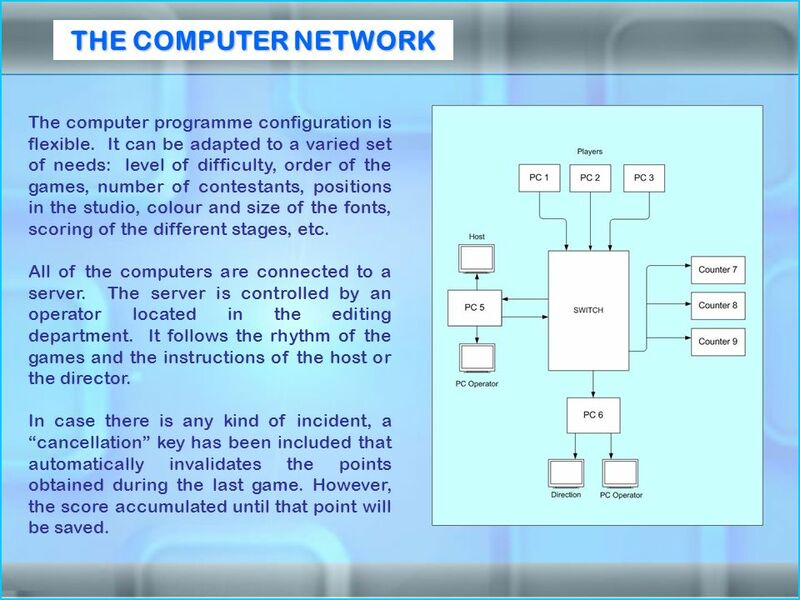 11 THE COMPUTER NETWORK The computer programme configuration is flexible. 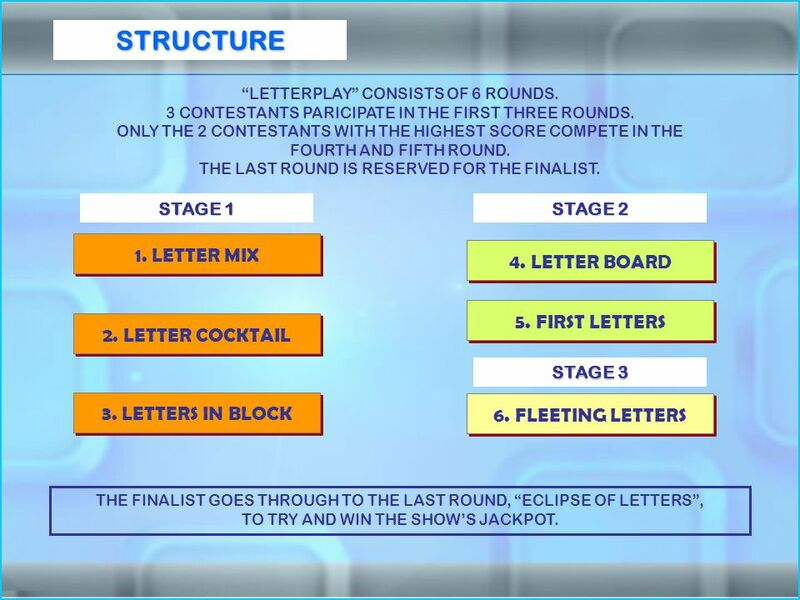 It can be adapted to a varied set of needs: level of difficulty, order of the games, number of contestants, positions in the studio, colour and size of the fonts, scoring of the different stages, etc. All of the computers are connected to a server. The server is controlled by an operator located in the editing department. It follows the rhythm of the games and the instructions of the host or the director. In case there is any kind of incident, a cancellation key has been included that automatically invalidates the points obtained during the last game. However, the score accumulated until that point will be saved. 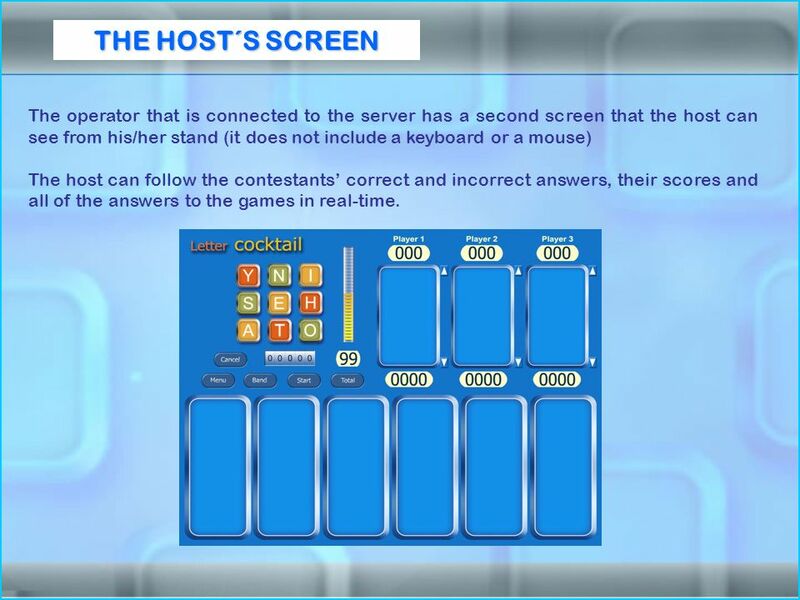 12 THE HOST´S SCREEN The operator that is connected to the server has a second screen that the host can see from his/her stand (it does not include a keyboard or a mouse) The host can follow the contestants correct and incorrect answers, their scores and all of the answers to the games in real-time. 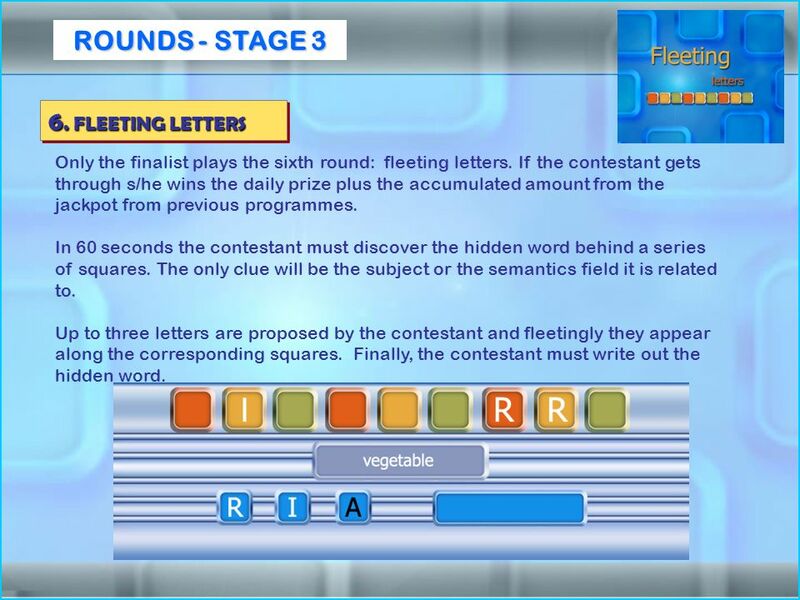 Download ppt "THE CONCEPT GENRE: QUIZ SHOW TARGET: FAMILY FREQUENCY: DAILY LENGTH: 30 GOAL: EDUCATIONAL LETTERPLAY is a quiz show based on words that rewards an excellent." Using Graphics in the Math Classroom. Benefits to using the Graphics 1.Students become familiar with the common pictures they will see 2.Students learn. Extra Credit Challenge III Chapter 18 How it works Your group is your own table If you participate and avoid disqualification, you automatically get. Mr. Moneybags A Write On Activity Play and Win! Directions: Create 2 teams and a captain for each team: A Team and B Team Each team member prepares a.
XP New Perspectives on Microsoft Office Word 2003 Tutorial 2 1 Microsoft Office Word 2003 Tutorial 2 – Editing and Formatting a Document. Bare Necessities D OTS B AMS C RACKS F LOWERS H ONORS & J OKERS * White Dragon is also known as the soap tile and can be used as a 0 in years, ie. The Poker Squares Family: cards, letters, and hexes Todd W. Neller. An Extra Point Quiz. Are You Smarter than a Pre-Calc Student is a game in which the first 10 questions the class is playing the game together to earn. Coordinate Geometry Vocabulary Game By: Zani Alam.